Possibility of manufacturing snacks (or pellets) with or without inner holes (such as eyes and mouth in a face) by means of a two-phase cutting system. 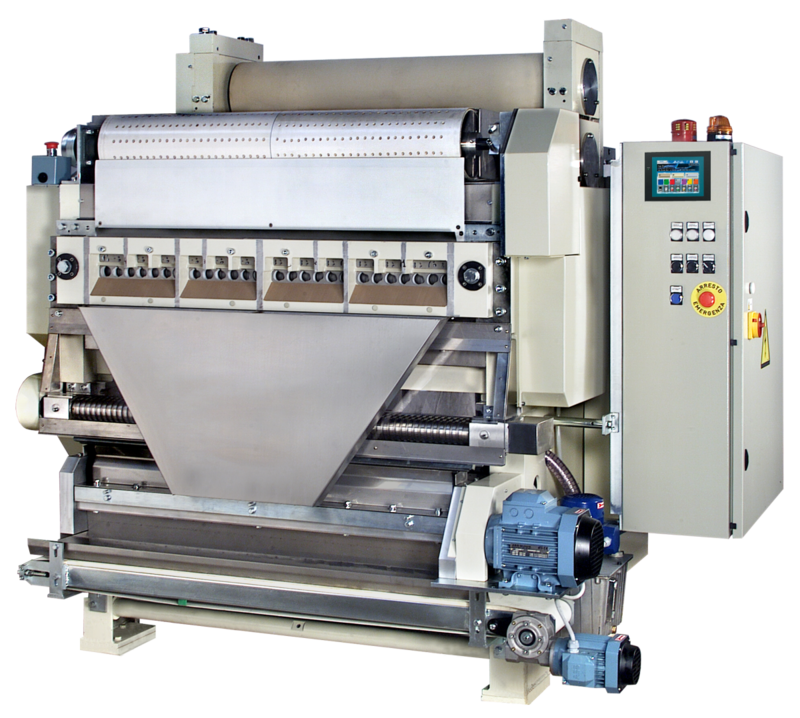 Advancing system of dough-sheet through belt in order to achieve a decimillimeter accuracy among the various cuttings. Double conveyor for scraps either coming from stamping of dough-sheet or from cutting the inner holes. High mechanical sturdiness which allows to cut even thick dough-sheets, thanks to a supporting system of the cutting bar with four gliding surfaces. all the above in absence of vibrations thanks to the dynamic balance of all parts. Manufacturing capacity up to 250 strokes/min', even for moulds with inner holes. Supervision of correct functioning through PLC. Depending on the characteristics of dough, the calibration unit can be equipped with calibrating rolls (to reduce and equalize thickness) or with rubberised rolls (for mere transport) as well as additionally - as an option - with manual or through Encoder controlled adjustment of thickness to be saved in recipes in the PLC of the cutting machine or directly in the PC of the production line. Cutting device for scraps, synchronized with dough-sheet movement, for longitudinal cutting and, optionally, for transversal cutting in order to further reduce dimension of scraps before their re-mixing, thus improving homogeneity between the new mixture and the scraps. New conveyors to load the pasta shaker. A range of shapes more and more imaginative and extensive allows to enrich the production with new designs.